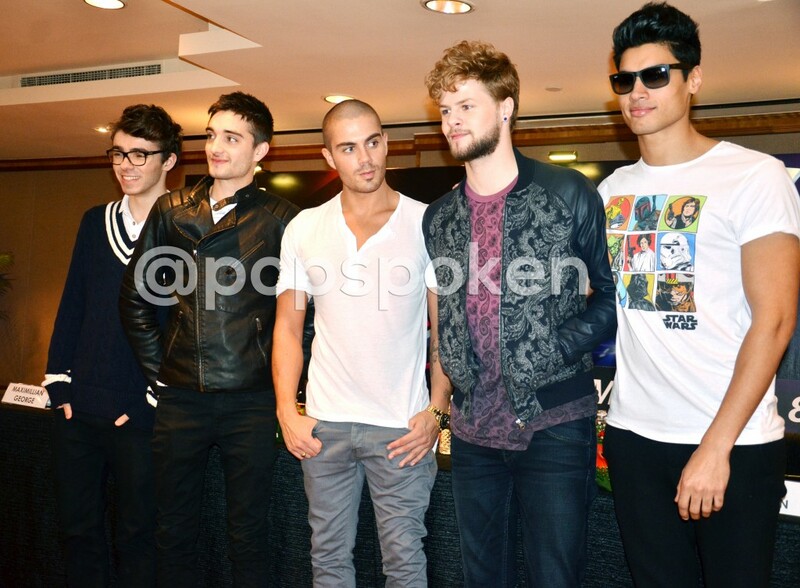 The Wanted are in Singapore yet again! The Irish-English boyband are gracing our shores for the fourth time, headlining for Mediacorp’s “Celebrate TV50” event, a 7-hour bash that also doubles as this year’s countdown party. So who HASN’T heard of The Wanted?! The group of five young UK lads have constantly been at the top of the UK charts since their inception in 2009, and have seen great success in the international charts as well. Nathan Sykes, Max George, Siva Kaneswaran, Jay McGuiness, and Tom Parker have taken the UK music scene by storm, hit after hit. After their sophomore studio effort “Battleground”, the boys have armed themselves yet again with a new album, “Word Of Mouth”, and are also embarking on a global arena tour of the same name. We were, therefore, incredibly delighted to hear that The Wanted were having a press conference prior to their New Year’s Eve performance at The Float @ Marina Bay. Hosted by DJ Rozz from 98.7FM, the press conference was filled with sass (mostly from Nathan Sykes), laughter, and lots of subtle nuances about the members’ views on their past. The boys arrived 45 minutes after the scheduled time, citing “taking showers” as their cause for delay. Rozz took the time to inform the press of the details surrounding the Celebrate TV50 event, but started off with a short and shocking announcement that she may be leaving 98.7FM soon. More details of the Mediacorp Celebrate TV50 event can be found later in the article. 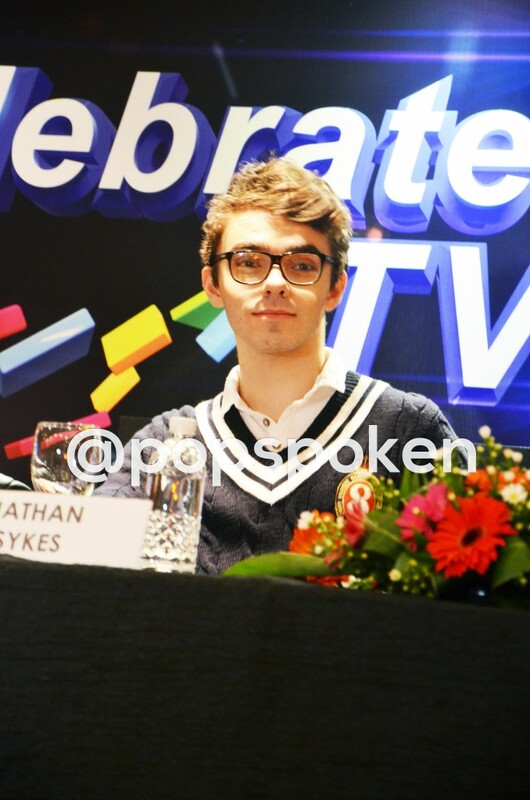 The Wanted ambled into the media room clad mostly in casual t-shirts and jeans except for Nathan, who went for a preppy look with a black cardigan and a pair of glasses. Jay, who was to speak the most in the span of the interview, jazzed it up with a leather jacket (in Singapore weather, no less). 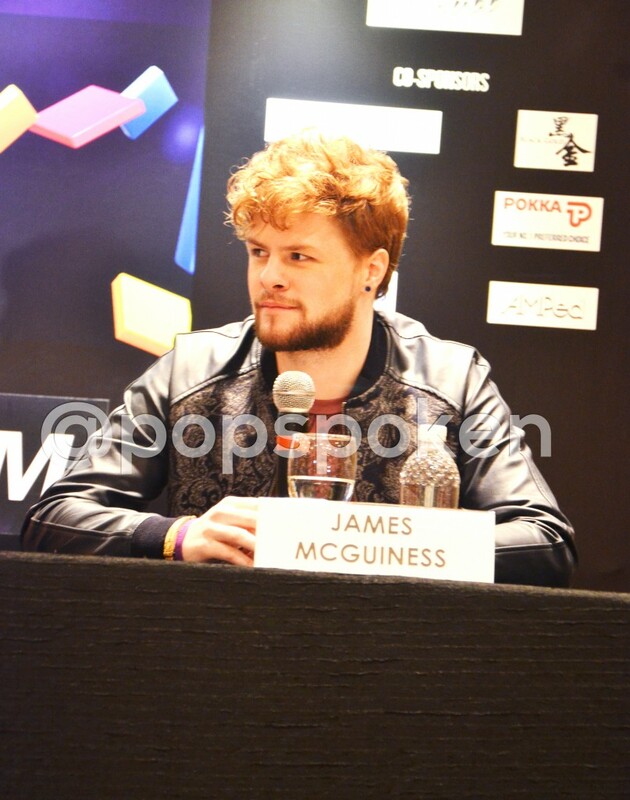 When asked about the one thing that drew them to Singapore, Jay responded “(It’s the) soul! It’s the people!”. He then elaborated, “I think cities can be beautiful and impressive, but sometimes it takes people’s attitude and culture to make you have that soft spot in your heart”. Siva echoed this view, claiming that “everyone’s really nice”. 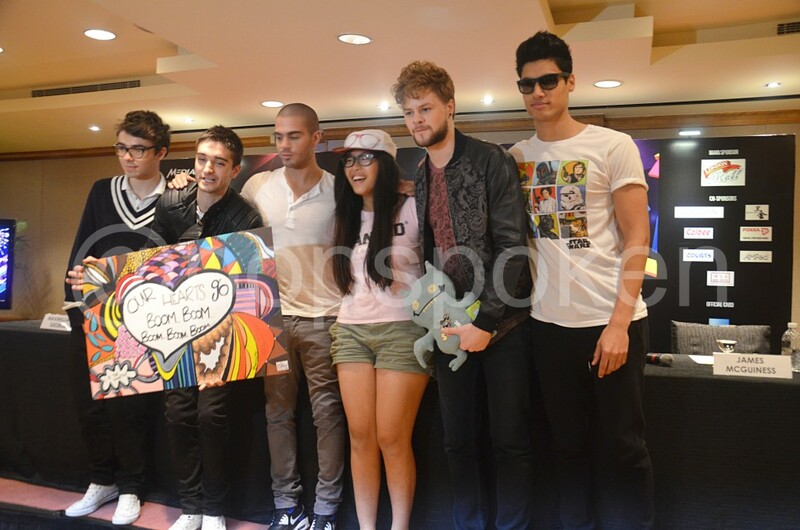 Score one for you, TWFanmily Singapore! Rozz delved into the list of 30 screened questions, starting with a generic query about the quintet’s performance tomorrow night. The group revealed that the set will contain “new songs that Nathan has written”, and told fans to watch out for his return to the stage after his bout of vocal surgery back in early-2013. Nathan himself jokingly stated that he brought with him many demands upon his return, such as “getting the middle seat”, pointing to his allocated seat in the centre of the five chairs. He also made fun of his vocal issues, claiming that he “couldn’t drink in the US” due to age restrictions, and thought he “might as well get surgery”. Rozz’s misheard speech was to cause some laughs when she added on to Jay’s recounting of the group’s past visits to Singapore. Peanuts on the floor of a bar in Raffles Place that the group had once visited was misheard as something a lot more risqué, eliciting chuckles and double-takes from Nathan and Tom. The questions took an interesting turn when Ross posed the question: “What was your biggest event in 2013?”. The room waited with bated breath, all intently hoping for Nathan Sykes to reveal some details about his rumoured split with American singer Ariana Grande. Max, however, immediately responded with a loud sigh, and revealed that he wasn’t entirely proud of “the TV show”, a reference to the E! series “The Wanted Life”, a reality show about the boys which aired in June and July 2013. Siva agreed with him, but both made it clear that their dissatisfaction did not stem from working with the production crew. The mood was somewhat lightened with the mention of the group’s 2014 world tour. Max stated that they would be performing only 4 new tracks from the album for tomorrow’s performance, leaving the rest of the album for the actual Word Of Mouth tour. Rozz then sneakily redirected the topic back to the members’ biggest regrets in 2013 which they would not want to repeat in 2014. While Jay’s biggest regret was getting a side of his head shaved during a night out with fellow member Max, Nathan’s response was the zinger we were waiting for. “Everything happens for a reason, and the glass is always half full”; a cryptic message that can be interpreted in many ways, “I’d rather focus on the positives and we had a really, really fun year”. The switch to the inclusive pronoun “we” effectively ended our hopes for any more juicy news stories. Iggy Azalea was The Wanted’s ‘Most Wanted’… for a collaboration! The Australian rapper was Max’s top choice for featured artist, and Rozz couldn’t help but mention how she was SUPPOSED to be headlining in a local “event” (*cough* 1 World Music Festival *cough*). Sufficient shade thrown, yes. The questions then entered the “fun” category, as labelled on Rozz’s sheet, with the question “Who, except for Rihanna, walks best like Rihanna?”, referencing their Dr. Luke-penned track “Walks Like Rihanna”. Nathan then cheekily replied “You?”, prompting Rozz to catwalk dramatically across the front of the stage (psst.. watch it on our Instagram). But with all sincerity, the boys asserted that any girl who has the “attitude of Rihanna”, even someone with a limp, could be the song’s target. When asked if they would do anything special onstage to commemorate the new year (e.g. a striptease), Nathan was adamant that they would never do such a thing, even if offered money to boot. As the press conference came to an end, one journalist was to ask if the band could reveal the “big news” that they had tweeted about on their official Twitter account. The boys refused to answer and shied away from the question, obviously well-briefed by their publicists not to leak this piece of news before its expected date. We’ll just have to wait then! Although I was not the biggest fan when I went into the media room, I walked out genuinely won over by the group’s humility, down-to-earth character, and basically their innate characteristics as the “anti boy-band”. With their flirty comments, openness about bar-hopping, and their acknowledgement of poor choices or past weaknesses, The Wanted are a group that goes beyond the superficial, curated image that most bubblegum pop groups usually adopt and are bound by. For that, I gladly applaud them. The Wanted will be performing at Celebrate TV50 on 31 December at The Float @ Marina Bay. Tickets are priced from $28 and will be available (via cash only) on 31 December at The Float @ Marina Bay (Entrance A, 5pm – 12:30am), and at Millennia Walk (10am -10pm). TIP: We hear that the $28 tickets are running out faster than the $68 tickets, so grab them quick! 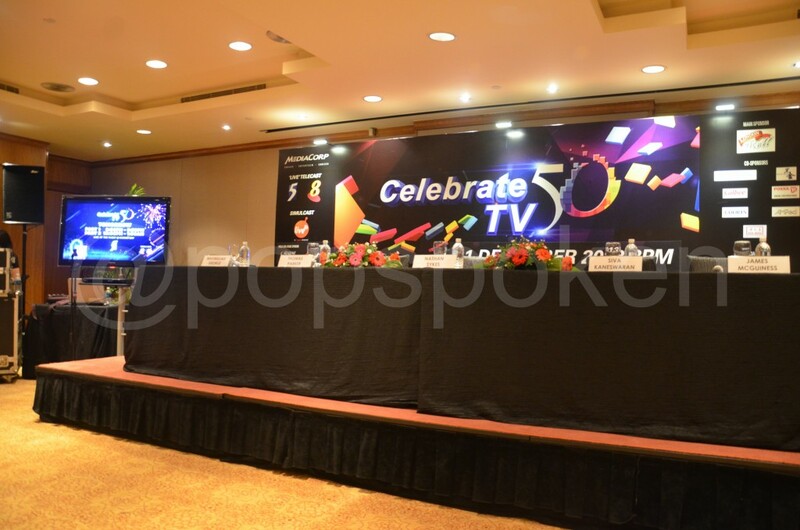 Celebrate TV50 will be telecast on Channel 5 and Channel 8 LIVE from 8pm on Tuesday, 31 December 2013. The show will also be simulcast on Toggle LIVE.